Okay guys. Around a month and a half ago, there was a controversy that encompassed the Internet DC Comics was celebrated a month of Joker variants of their comics following one of his sidekick, Harley Quinn. Anyway, one of the covers that featured the main adversary of the caped crusader was that of Batgirl. Now, the current Batgirl is Barbara Gordon, the original Batgirl. This is important because she stopped being Batgirl in 1988 with Alan Moore’s Killing Joke. The Killing Joke is quite the controversial comic book among fans as it the Joker commits pretty disgusting deeds against Barbara Gordon and her father. In the book, the Joker shoots and paralyzes Barbara, strips her naked and takes pictures of her. He then shows those pictures to her father in attempt to break him to the point of insanity in order to prove that anybody can go crazy after “one bad day.” Originally, that book was not considered canon to DC Comics, but elements of it eventually did and for twenty-three years, Barbara was paralyzed and instead of Batgirl worked as Oracle, Batman’s tech-save assistant. In 2011, DC rebooted their entire universe and made Barbara Gordon mobile again. In the New 52 continuity, she was temporally injured, but recovered and returned to the identity of Batgirl. This was also a controversial move as some people liked her as Oracle, believing her to be a champion for disabled fans. There are also people who preferred her successors. Now, flash forward to 2015. The Joker cover comes up with an image of the Joker and a terrified Batgirl. 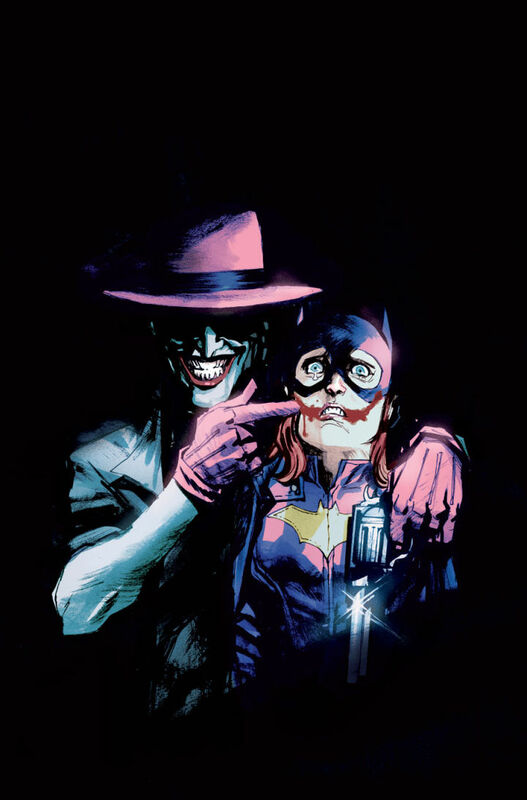 This was seen by many to be an homage to The Killing Joke, provoking a backlash on Twitter spurring the trending hashtag, #changethecover. DC eventually capitulated and pulled the variant from publication, prompting praise and criticism. Okay. Opinion time. Personally, I am not a fan of The Killing Joke. I thought it was unnecessary and I didn’t like how it ended Barbara Gordon’s career as Batgirl. I thought some of the stuff in the comic was wrong and I dislike the direction entertainment goes when it tries so hard to push the envelope and be edgy that it’s no longer fun to consume. Alan Moore himself even regrets writing it. But, that said; I don’t think the cover should have been pulled. It’s a variant. Not even the main cover. If somebody wants to buy the issue, they can just buy it in its standard publishing format and enjoy the story. Vote with your dollars people. There is no need for censorship. characters have existed for half a century or longer, and their adventures are legendary. But wait! Aren’t these new versions being marketed to a mass audience, beyond the minority of Americans who go to their local comic book shop every Wednesday? Absolutely! But this doesn’t require ignoring long term fans who are the the core supporters of the genre. Sure there are new readers, but most aren’t attracted by seeing a good movie. If they did, Marvel would have gained tens of millions more readers after releasing the very successful Avengers movie. Actually, more people are attracted to comic books from animation, which follows the source material more accurately than live-action. character they read about and one they on screen is assuming they are either lazy or too stupid to understand the difference between two different forms of entertainment.This is the 21st century and there’s a little thing called the Internet where you can research a character’s backstory. There is no need to change things through useless reboots or retcons when everyone has access to the history of these characters. costume of comic book heroes to seem less cheesy and more practical. Fine. But when the new costumes spill into the comics we have a problem. The first notable time this happened was after the release of the first X-Men movie. The X-Men are known for wearing colorful costumes, but in Fox’s adaption they all wore black leather. They were shortly introduced in the comics during the run of writer Grant Morrison. Thankfully the X-Men eventually reverted back to their old style, but the trend was only begining. With the release of the third Spider-Man movie, Marvel put Spider-Man in the black suit to match the one Tobey Maguire wore. This came after the change made in 2004 where Spider-Man’s mechanical webshooters were replaced by organic Webshooters, like the movie version. These changes were also reversed. The peak of costume changes came as the Marvel Cinematic Universe grew. Hawkeye’s costume changed from a circus costume with a loin cloth and colorful mask, to a shirt and pants with a pair of sunglasses. Star-Lord lost his helmet and military outfit and donned a red trench coat and a new mask that didn’t cover his now reddish hair. Captain America traded his winged mask with ear-holes for a helmet that covered his ears and had painted on wings. James Rhodes traded his War Machine armor for the Iron Patriot armor. A lot of comic book characters have been losing their classic costumes in favor of newer more “practical” ones which is making characters at minimum, slightly different and at most, unrecognizable. Another segment of this is change in race and familial relations. Recently, Marvel decided to retroactively revise the history of Qucksilver and the Scarlet Witch to no longer be mutants and children of Magneto, because the version of these characters in the upcoming Avengers 2 can’t use mutants and Magneto because Fox owns them. This completely alters the identities of these two characters and in addition, excises their Jewish-Romani heritage. Another situation is that of Nick Fury. While Ultimate Nick Fury has always looked like Samuel L. Jackson, the version in the main Marvel Universe has always been a middle-aged white man with black hair, graying at the temples. Marvel discarded the character created in 1963 by “revealing” that he fathered a biracial son who just so happens to look like Samuel L. Jackson. They also “revealed” his name is really Nick Fury Jr., removed his left eye, and promoted the new Nick Fury. Meanwhile the old Nick Fury became a senior citizen chained to the Moon. I’m not kidding. Marvel’s editors argued that since most of the world knows Nick Fury as a man who looks like Samuel L.
Jackson, they had to reflect that in the comics. On the DC side, the new Flash show cast black actors for the West family. Then DC, without skipping a beat, realized that they didn’t introduce Wally West into the new continuity and decided to make him biracial to coincide with the show. They also made him twelve-years-old and a juvenile delinquent with an absent father which is makes him a walking racist stereotype, but that’s another story. The images posted demonstrate the process in which Nick Fury was changed. The first image is classic Nick Fury from 1968’s Nick Fury: Agent of S.H.I.E.L.D. #4. The second image is a poster of Samuel L. Jackson in the 2014 film, Captain America: The Winter Soldier, the third image is the newly introduced Nick Fury Jr. from the pages 2012’s Battle Scars #6, and the final image is of an aged Nick Fury chained to the moon in 2014’s Original Sin #8. Personality makes a character unique of course. While I admit that some influences of outside media positively changed one character in the comics, (namely Tony Stark becoming a sarcastic jokester) most of the personality changes made to reflect the movies are negative. happens to be in charge has the ability to manipulate that character’s reality. Shakespeare may get adaptations of his plays, but Shakespeare is always Shakespeare. There will never be a person who decides that from now on, every version of a certain Shakespeare play has to take place in the 21st century because more people are familiar with the modern day adaptation than the original. Comics should be treated the same way. If someone wants to change things as an adaptation, and introduce new characters to reflect diversity, go for it. Just don’t change the source material to match the change.